This post is going to be full of a lot of awesome things – first, because it’s part of a #VirtualPumpkinParty with some other rockstar bloggers, and second because I got to make this recipe with a secret weapon – my best friend!! Backtracking… It was my birthday at the end of September, but I wasn’t looking forward to it very much. I always have a bit of bad luck on my birthdays. Something bad has happened on that day for as long as I can remember. But actually, this year turned out to be quite nice! Despite everything going on at work, my friends really cheered me up and we all had a great time. But the best part of my birthday wasn’t to come until a few days later. I had just come back from grocery shopping with my friend Jon, and we were walking down the corridor to get to my apartment. I turned the corner and saw something that took me a few moments to register…. it was my best friend in the world, Alex!! I wish could have gotten a picture of my face at that moment because it was so funny. I’m pretty sure my jaw hit the floor. Alex lives in Rochester, NY – which is over five hours away from me. We used to live 10 minutes away from each other in high school, and having her so far away now has been hard for me. But there she was, standing outside my door, with a gift bag and a huge smile. It took me a good five minutes to process that she was actually here. Then, once it hit me, I just burst into tears – so grateful that she was here, so overwhelmed to be reminded that our friendship was still true, so happy that I would be able to spend the day with her. Alex and I were trying to figure out what we wanted to do together that day, and I was telling her about my blog and the Virtual Pumpkin Party I was part of. I told her that I wanted to do something a bit different, savory, and was thinking about making pumpkin gnocchi. She immediately loved the idea and said she would help – which turned out to be quite fortuitous, as Alex is half Italian and has grandparents, aunts, uncles and cousins over in Italy. She said she would teach me how to make gnocchi like her nonna – who, of course, is the HOLY GRAIL of cooking knowledge. 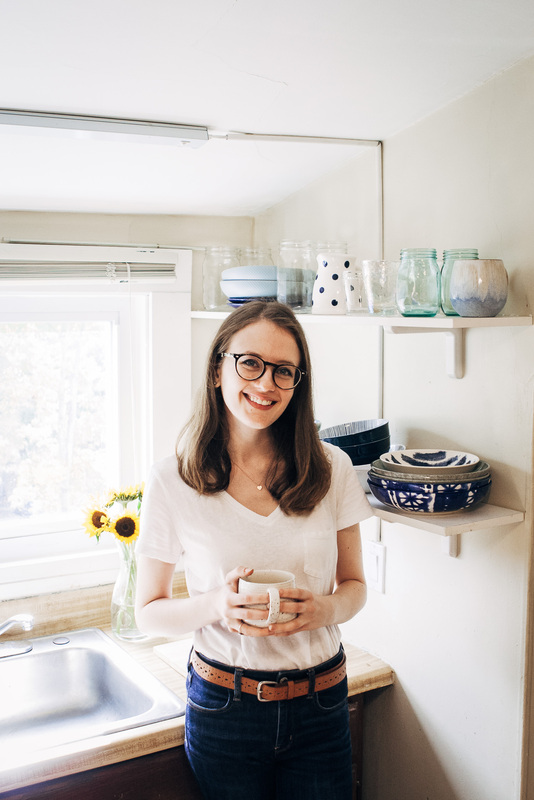 Now about the Virtual Pumpkin Party – when Sara of Cake Over Steak asked me if I was interested in taking part of this online celebration, I felt like one of the cool kids had just told me I could sit at their table in the cafeteria. Seriously!! I feel like I’m still a fairly new blogger, and I’ve never been invited to a virtual party or roundup before. And Sara is one of the coolest bloggers out there – she actually makes these kickass illustrations to go along with her recipes, which really sets her apart. 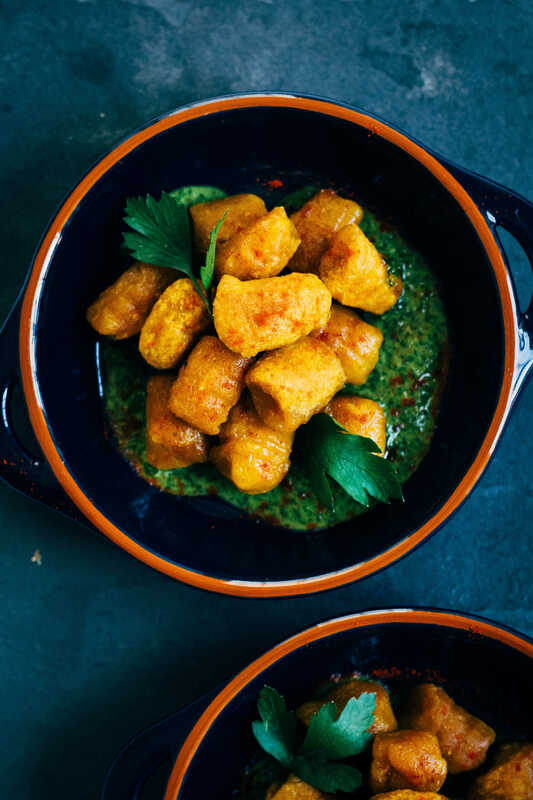 An autumn twist on an Italian classic, this pumpkin gnocchi is made with love, and paired with a perfectly delicious parsley and mint pesto. 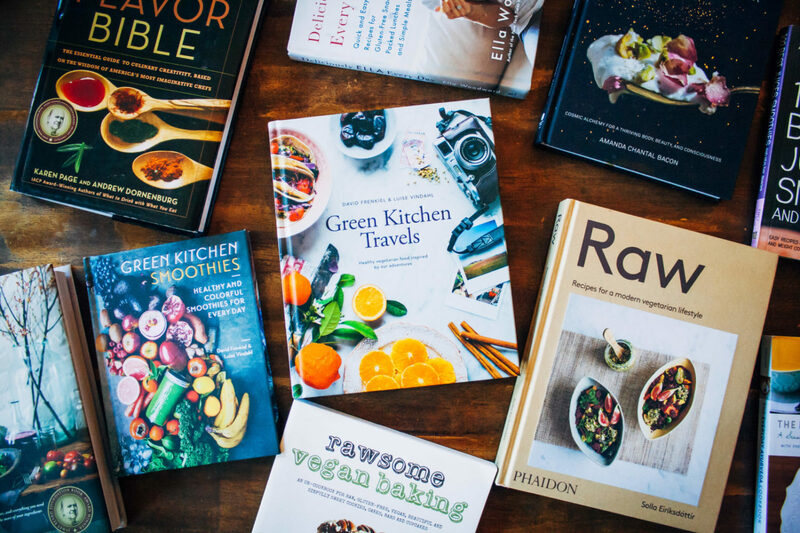 RECIPE EDIT made August 2018. My apologies, I mixed up two of the measurements. To make the gnocchi, first mix together the flour, harissa powder, and salt until evenly combined. Then, add in pumpkin purée and olive oil. Mix together with a spoon until clumps form, then start kneading with your hands. Knead the gnocchi dough until evenly mixed. 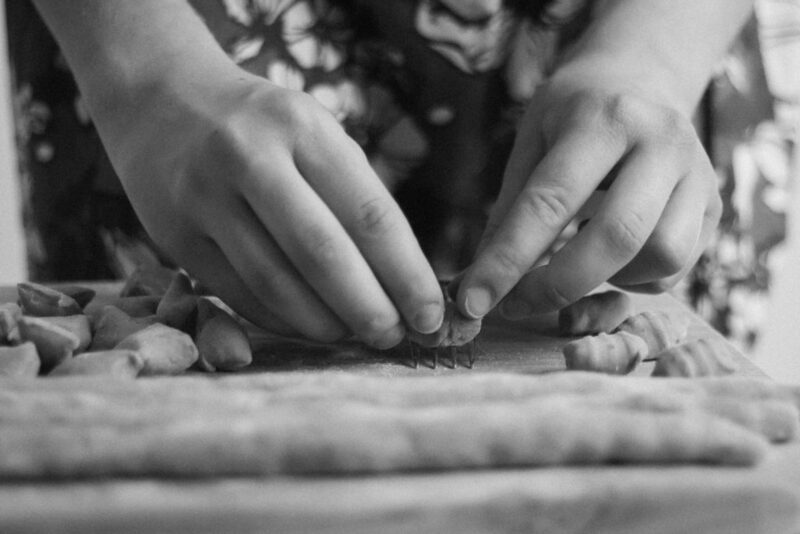 Be careful not to overknead - it will make gnocchi tough. When done, dough should be malleable but not falling apart. If it's too dry, add a little bit more olive oil. If it's too loose, add a little bit more flour. To make gnocchi shapes, roll out the pasta into little "snakes", about 1/2 inch wide. Cut the gnocchi at 3/4 inch intervals. Keep repeating this process until you are out of dough. 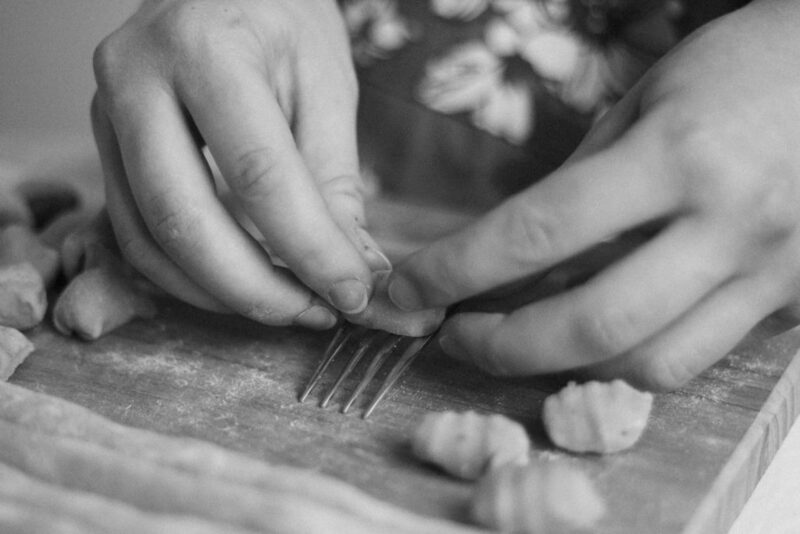 This next step is optional but recommended - using a fork upside down, roll gnocchi down, applying slight pressure, so that little indentations are made. (See photos for reference). This is a very time-consuming and laborious process, but I think it really makes a difference! Once gnocchi are all done being formed, bring a big pot of water to boil. 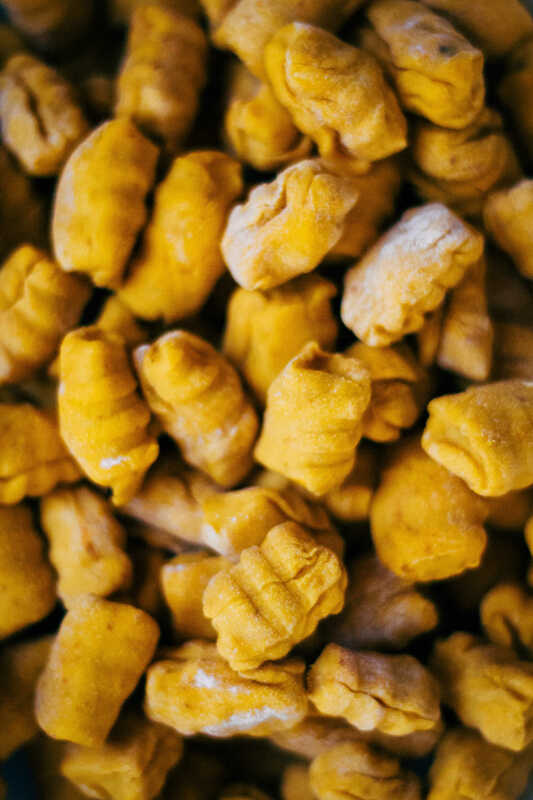 Cook the gnocchi in batches for 4-5 minutes each, or until they float to the top of the water. I cooked mine in about four batches, but this will depend on the size of your pot. This next step is again optional, but highly recommended - bring a little olive oil in a pan to medium heat. Fit as many gnocchi in the pan as you can without them overlapping, and sauté in olive oil until the edges are slightly browned. This adds a nice little crunch and greatly helps with the texture! To make the pesto, combine all ingredients in a food processor and pulse until leaves are finely chopped. To serve, take as much gnocchi as desired and drizzle or toss with pesto. Enjoy! If you make this recipe, be sure to tag me on Instagram @wellandfull so I can see your creations! That’s fantastic! (I always have something bad happen on my birthday too though, I never look forward to it anymore), at least it turned out great!! And I just made my first gnocchi last week…obsessed! I’ve missed that dish for so many years! I love gnocchi but can’t find them vegan and kosher so this recipe is very welcome. Is it possible to make these a day before and cook them up the following day? Or boil them and then do the reheating in the pan the following day? How long does it take to get them ready to boil? My time is limited on Fridays but I’d so love to serve them for a Friday night dinner. Can they be kept warm for a couple of hours? Yes to all of your questions!! 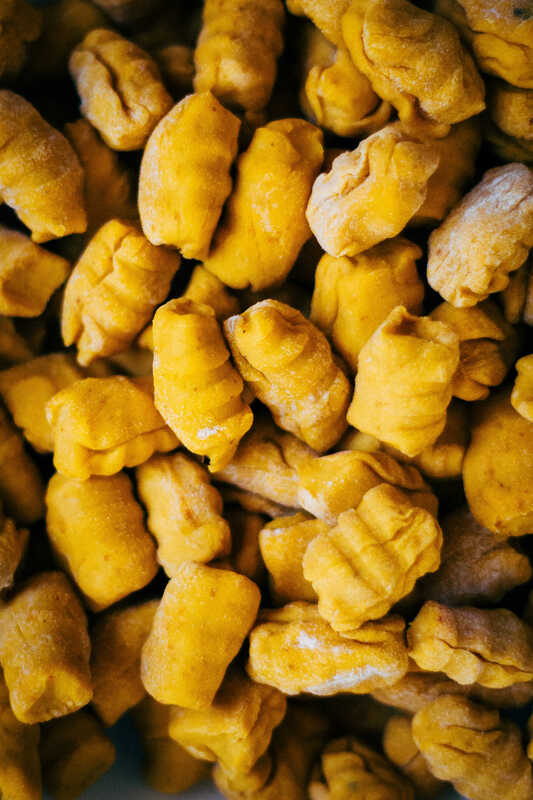 I actually have a bunch of these leftover in my freezer right now ;) This is how you do it… when you make these gnocchi, I would recommend boiling all of them, at least quickly, so they’re cooked. If you freeze them in raw dough form, they’ll stick together! So boil them, let dry a little bit, then pop them right in the freezer! When you’re ready to thaw, stick them back in some boiling water for 5-10 minutes, or until they’re thawed. They can also keep in the fridge for a week! :D Hope this helps! Yes a big help; I may use squash puree instead, but I’ll definitely be making these. thanks!!! 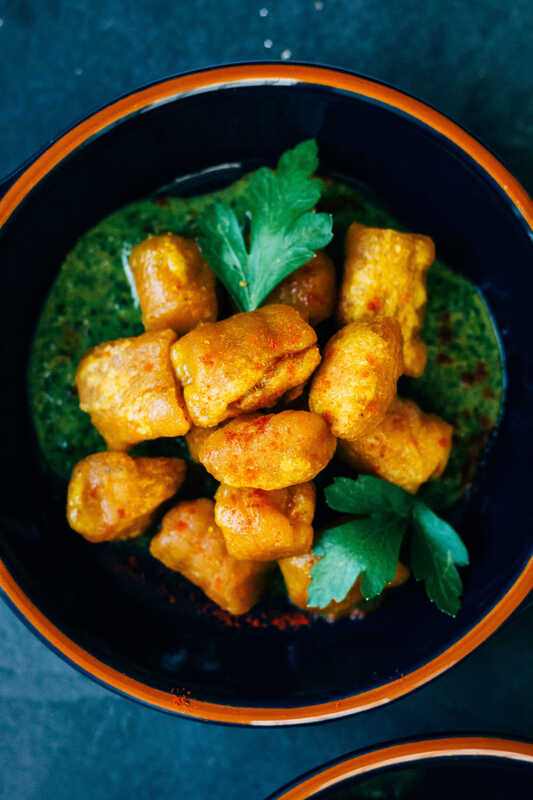 Yay for best friends and pumpkin gnocchi – these look fabulous with the harissa and mint pesto! Yum! Happy pumpkin party day! Looks PERFECT! I love your pasta posts <3 That gnocchi sounds perfect, especially with the pesto! I'm getting super hungry. Oh man, loving that mint pesto!! This looks GREAT! Wow I love the flavor combo here… I’m so used to seeing the classic sage/nutmeg/cream flavors with pumpkin & gnocchi. This is so fun! What a stunning dish, in both colour and flavours. I’ll definitely be making this! These gnocchi look amazing, Sarah! Your story about your friend was so sweet. These types of stories about coming together over cooking a meal are what makes me love food, cooking, and now this food blogging community. It’s so funny what you said about receiving the invitation to the pumpkin party. I felt the same way! Haha! Hahaha!! But we’re newbie blog twins, right? ;) As we just discovered today!! Your surprise visitor and day of gnocchi making sounds amazing! What a great way to spend your birthday! I’m a big harissa fan, so I now I’m going to love this recipe! Aw…so sweet that your boyfriend organized the whole thing and that you got to spend the whole day with your best friend! It looks like you’ve put lots of love into your recipe because these gnocchi sound pretty amazing!! I love the pesto and harissa addition. YUM. Such a great idea! I’m finally getting to actually and truly read through all of the great posts we all shared on Wednesday. Sarah, your words brought tears to my eyes, as did the thoughtfulness of your boyfriend and friends. Those moments are so few and so precious; they’re meant to be cherished and shared. And that’s what the blogging community is all about. SHARING. I’m loving and envious of the fact that you got some serious hands-on training from a pro on the gnocchi topic! I want a hands-on tutorial! :-) These look amazing, and I think the mint pesto plays well with the savory, rich flavors. I just made some parsley and basil pesto with the remaining herbs from my garden, and I’m dreaming of a gnocchi situation like this one. XO! What an awesome surprise! I hope you had a day that you will cherish forever with her :) And who better to help you make this lovely gnocchi creation, it was clearly meant to be! The virtual pumpkin party round up is full of so many mouth watering recipes! That is the sweetest story! I was already thinking how awesome these gnocchi sounded but now!? Even better. And what a sweet BF!! Surprise friend visits are the best. Seriously, so wonderful. This gnocchi looks amazing! Aww surprises are the best and it was so sweet of her to show up! I have a knack of ruining surprises for myself (lol) but this is just super sweet and makes my heart melt. I have a soft spot for gnocchi- it’s so fun to roll out but I never make my own because I have a go to place in Toronto where they make the fluffiest gnocchi in the world. I’ve been taking advantage of all the pumpkin while I can and this sounds scrumptious! this is awesome in every level!